After being incarcerated for as long as 5½ years without ever being charged with a crime, all of the Chinese refugees who were held for years in Kern County's Lerdo Detention Facility have now been released. Wan Tin Chin was released on January 14, Zheng Fong Zhen was released on January 26, and Lin Li Juan was released on January 28. A homemaker in Indiana tirelessly lobbied the INS on behalf of Zheng and Lin, finally arranging for $15,000 of bond money to be posted. She had heard about the refugees when former refugee "Zhou" (who was freed in June of 1998) spoke at an Indiana Right to Life banquet with her adopted American mother. The LifeHouse provided temporary accommodations for Zheng and Lin while travel arrangements were made. Both women will be living with their families in the Eastern United States. 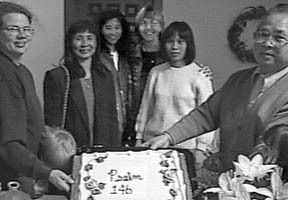 The ministry of Voice For Life to these refugees began in December 1994, when Tim Palmquist became aware of the women in Lerdo who were trying to escape from forced abortions in China. Various tactics, including hunger strikes and unscrupulous lawyers, were used by some over the years in an effort to free the refugees. "In the end, however, the glory goes to God! We believe that God used the prayers and efforts of Christians all over the country to make the difference for these precious ladies," Tim contended. A total of 26 Chinese refugees from Lerdo finally received the freedom they sought so earnestly for so many years. "This was no small feat," Tim explained, "because every one of these refugees had already received their final deportation orders. Most people thought our efforts were futile." Future Chinese refugees who come to the United States fleeing forced abortion will hopefully receive better treatment, due to the law which was passed in October of 1996 which grants asylum to victims of forced abortion and forced sterilization. A few Chinese women continue to be incarcerated at Lerdo, but those who remain have been detained for only a few months, while they await their first deportation hearings. Voice For Life may continue to help these and other refugees who request assistance (only one remaining refugee is currently interested in assistance). Please continue to pray for these refugees to be granted asylum. The conditions of their release could still result in their eventual deportation.